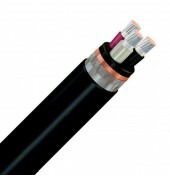 Armoured cables for variable frequency drive systems with maximum degree of screening for both low and high frequencies. Combined shield coverage: 100 %, flexible conductor to improve hand ability in installation process, fire retardant, halogen free, oil and Mud Resistant. Tinned copper stranded class 5 according to IEC 60228, High modulus ethylene propylene rubber LSF (HF HEPR) insulation according to IEC 60092-351, Halogen free compound bedding, Copper/polyester tape screen, Tinned copper wire braid armour, Thermoset compound type SHF Mud outer sheath according to IEC 60092-359 / NEK 606:2004.